Inspired by the traditional aluminium undertray on racing Morgans, I decided to design and make a fibreglass interpretation for my ‘75 Plus 8. This involved the complex process of fabricating a model, creating a mould and then making the undertray from the mould. To see how they were developed click here. 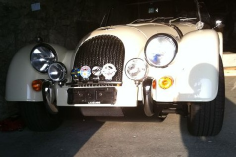 I was so pleased with the way the undertray enhanced the look of my Morgan that I decided to offer it to other Morgan owners. Each undertray is made to order, using hand laid fibreglass composite materials - a process which takes about two days. It was a Swiss customer who dubbed it the “downundertray”. 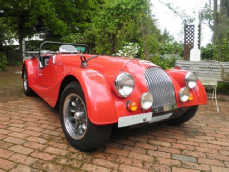 I have now produced a second model (MK 2) to suit the latest traditional Morgans with overriders. This is slightly wider and has larger radius curved edges for added elegance. Fitting of this undertray on newer cars with overriders requires the removal of some non-critical metal from the overrider supports. 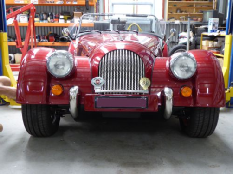 The undertrays looks perfect as supplied in satin black or they can be made with a coloured gelcoat or custom painted to match your Morgan. No drilling of your car's bodywork is needed. 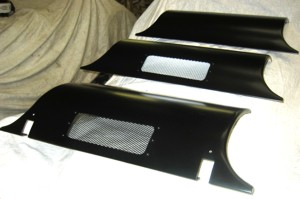 They look great and improve cooling by creating a negative pressure below the engine bay. Click here for a brochure. Custom colour matched to your car and painted in two-pack enamel. Each undertray includes all necessary fittings and comprehensive instructions. Please check with me for shipping costs.